Today.Az - Do not be silent! Pierre Spitz, a former Geneva colleague, had coined the term “silent violence” for policies which not only perpetuate the existing system but in some cases reinforce it by forestalling the development of a political consciousness which might degenerate into social disorder. 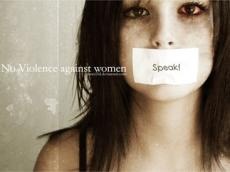 (1) In this spirit, we can speak of “silent violence” against women. Both at the international UN level and at the national level, there have been programmes devoted to the equality of women and to the promotion of women in all fields. There has been growing attention to physical violence against women, the creation of centers for battered women and attention given to the trafficking of women. There has been just enough attention to women’s issues and enough advances of some women to prevent “the development of a political consciousness which might degenerate into social disorder.” It has often been repeated that it is necessary to ensure the education, training, good health, employment promotion, and integration of women so that they can participate fully and effectively in the development process. Women have largely remained invisible and inaudible by being allowed to have the key role in the “informal sector” — those sectors of the economy that are the least organized, often left out of the statistics of the formal economy as if it did not count. Women have turned to the informal sector — or have been pushed into it — as a way of sustaining a livelihood for their families. Women’s work in this sector accounts for a large proportion of total female employment in most developing countries of Africa, Latin America and Asia. The informal sector, though often considered marginal in economic planning, tends to account for a significant proportion of total employment. In the informal society, women survive and often have a major responsibility for the economy of the whole family. Fathers are often absent by need or by choice. Some women do well in the informal sector and serve as a model — or a hope — as to what others can accomplish. Self-employed women are increasingly helped by micro-credit programs. These are useful but rarely do such loans allow a person to move outside the informal economy. There has been a good deal of research on women’s role in agriculture, on women’s informal-sector employment, and increasingly on women’s entrepreneurship. Researchers in different world regions have pointed to the handicaps faced by women to obtain credit and in getting access to new agricultural technologies. However, research has rarely been brought into the mainstream of global or national decision-making.